It takes some time for it to click – someone else is wading through the muck of her mixed-up movie worlds with her. Her words are getting through. This is where strangers meet. An alien makes contact with one of her own. For the first time, maybe ever, she realizes that she wants to communicate. Then, just like that, she’s talking to me, at hyper-speed. So I start decoding her, my dream girl, at hyper-speed. Years after this fling is over, he gets together with a university student, only to be betrayed by the universe (and terrorism…) when she demands a commitment. Finally, having got himself back on his feet, he meets his dream girl at the restaurant he sets up – and that’s when the sky falls in once more. 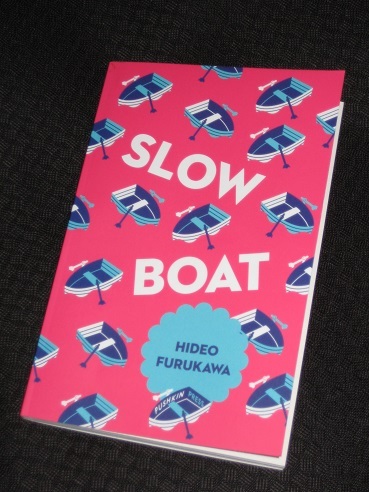 But what is Slow Boat? Well, in part it reads like a homage to Tokyo. The narrator makes a lot of his never having left his hometown (or, at least, his home prefecture), but what he’s actually doing in his story is taking us on a tour of Greater Tokyo (the overwhelming size of the capital is an idea mentioned in another story of his I read in the Comma Press collection, The Book of Tokyo), from the reclaimed coastline to the inland mountain villages, with the major train lines seen as the veins and arteries of the metropolis. You could image dedicated fans following in his footsteps, taking selfies in places where crucial scenes happen (I’m only half kidding here…). This preoccupation with the limits of language pervades the book, with the writer constantly trying to find the right words (and usually failing). There’s no reason you can’t do the same thing with stories. To take your love for the original and situate it in the present. Back to this book. To the subtitle: A Slow Boat to China RMX. A nod to Haruki Murakami’s unforgettable short story – “A Slow Boat to China”. The story where my story begins. It’s only when you go back to ‘A Slow Boat to China’ (included in The Elephant Vanishes) that you appreciate exactly what Furukawa has done in his work. He takes Murakami’s original concept, a story reflecting on three meetings with Chinese people over the course of his life, and adapts or expands on certain elements while playfully throwing in allusions to other works. Certain ideas from the original story (for example, the Yamanote line) take on a new significance in the remix, and while luck plays a minor role in Murakami’s story, Furukawa blows that up a little in his version, all the time staying true to Murakami’s ideas.